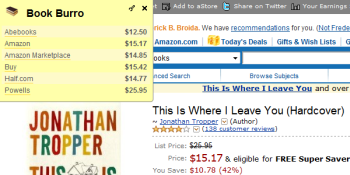 As a self-proclaimed cheapskate, I always, always look for the best possible deal. And that means before I order a book from, say, Amazon, I spend time perusing other sites (as well as price-comparison services) in search of a lower price. After installing it (and restarting Firefox, natch), just head to Amazon, Buy.com, or a similar store and find the listing page for the book you want. Then click the Book Burro button that appears in the upper-left corner. Venture into Book Burro's settings (by clicking the little wrench icon on its toolbar) and you'll see the option to add even more stores: Barnes & Noble, PaperBackSwap, and so on. Even cooler, Book Burro can check to see if your local library has the book, though I'm not quite sure how to interpret its "true/false" results. If an item comes up "false," does that mean it's checked out, or that it's not in the library's catalog? I'm guessing the former; if anyone knows for sure, hit the comments and let me know.